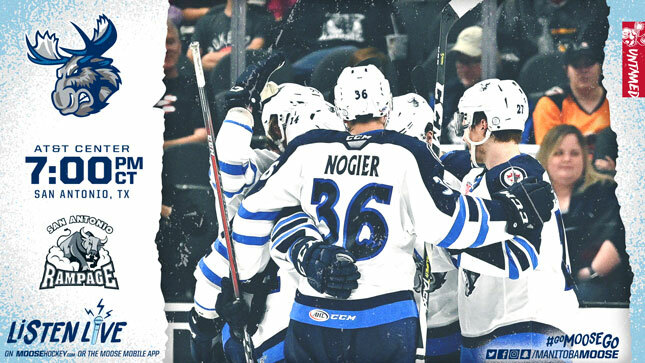 The Manitoba Moose (34-28-4-2) wrap up their five-game road trip in the home of the San Antonio Rampage (27-35-6-1) tonight at 7 p.m. CT. Moose fans can follow the action live on moosehockey.com/listenlive/, the Moose App, or streaming on AHLTV. Tonight’s game is a rematch of Friday night’s 2-1 Moose win. Ryan White scored both goals for Manitoba, his fourth and fifth goals of the season, as well as his fourth and fifth points in the last six games (4G, 1A). Maybe the most important part of White’s goals was their timing. Both markers came in the second frame, putting the Moose up 2-1 after two periods of play. The Rampage have struggled to mount a comeback effort this season, and haven’t won a game (0-28-2-1) when trailing after 40 minutes of play. Mikhail Berdin was sharp last night, as the first Moose goaltender not named Eric Comrie to play against San Antonio in 2018-19. Berdin stopped 27 of 28 Rampage shots, good for a 0.964 save percentage. The win over San Antonio was the eighth time in 25 starts Berdin has given up less than three goals, going 8-0-0 in those game. Friday’s game was also only the third time the Moose have given up less than 30 shots with Berdin starting in net. Surprisingly, it was also Berdin’s first win in a start when he faced less than 30 shots. Jansen Harkins had the primary assist on White’s first goal, his seventh point (2G, 5A) in seven games against the Rampage this season. Harkins could have a chance to add to those stats. San Antonio has given up the most goals in the Central Divison (223), and the seventh-most in the AHL overall. The Moose penalty kill shut out the Rampage last night, and have given up just one goal in the 16 opportunities on this crucial road trip. Over their last 10 games, the Moose have been exceptional down a man, allowing only four goals on 40 chances. The Manitoba victory was the first for a road team in the season series with San Antonio. The two points pushed the Moose into fifth place in the Central Division, just one point behind the Texas Stars, with two games in hand. San Antonio is currently on a 10-game losing streak (0-9-0-1) and desperate to climb out of their funk. San Antonio’s last win was March 5 at the AT&T Center, in a 2-1 effort over the visiting Chicago Wolves. 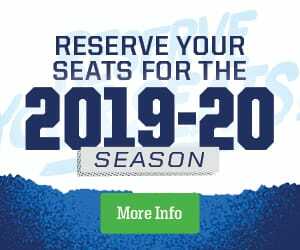 The Moose return to Winnipeg for their final homestand of the season which begins with back-to-back games against the Bakersfield Condors, starting April 2. To get tickets for the last remaining regulation games, head to moosehockey.com/tickets/.